A single-vineyard Amarone, the Il Bosco vineyard is nestled in the heart of Valpolicella Classico. The wine is rich with concentrated flavors of preserved fruit, particularly cherries. Aged in a combination of French and Slavonian oak barrels for 2+ years then bottle for an additional year or so, the bouquet is layered with hints of baking spices, cocoa, and toasted nuts through the long finish. A unique and complex production process renders a wine with similar characteristics. Hand-selected grapes are dried prior to vinification in stainless steel tanks. A juicy and flavorful red with a dark-berry, clove and pepper character. Medium to full body and a flavorful finish. A well-knit red, featuring dense tannins married to flavors of crushed black cherry, cured tobacco, smoke and Asian five-spice powder. Sleek and balanced, with a chewy finish. A beautiful wine that leaves a lasting impression on the nose and in the mouth. For starters, the bouquet shows a fine level of intensity that is bright but not overdone. Due to the wine’s age, the aromas veer toward dried fruit, cured meat and dried tobacco. Il Bosco shows a good amount of textural richness with fine tannins and thick structure. There is a hint of sweet cherry jam on the close. Dense and delicious, this opens with aromas of plum cake, tobacco, leather and blackberry. The rich palate delivers crushed black raspberry, mocha and chocolate alongside brooding tannins. Give it time to unwind and fully develop. Aromas of coffee, pomegranate, prune, fig, grapefruit and mint – with plum and cigar box. Complex medium-bodied palate of dry fruit, spice, earth and leaf notes. Plums and cherry finish with plenty of character and persistence. A soft, yet muscular wine. Boasting sheer beauty and might, the 2007 Amarone della Valpolicella Classico Il Bosco is a highlight of the Valpolicella. This type-A wine shows gorgeous notes of chocolate, vanilla coffee, smoked ham and tobacco. Fruit notes include creme de cassis and dried plum or fig. It finished rich and toasty with succulence and extreme balance. I would wait another few years before opening this bottle. It will award those who wait. Drink 2015-2028. The Cesari family has perfected its formula for achieving pure pleasure in liquid form. This is superstar Amarone, with loads of chewy, ripe fruit, decandent dark chocolate, leather, moist pipe tobacco and candied raspberry flavors. Even with all of the richness, extraction and deliciousness, this is a an elegant wine. Drink after 2018. 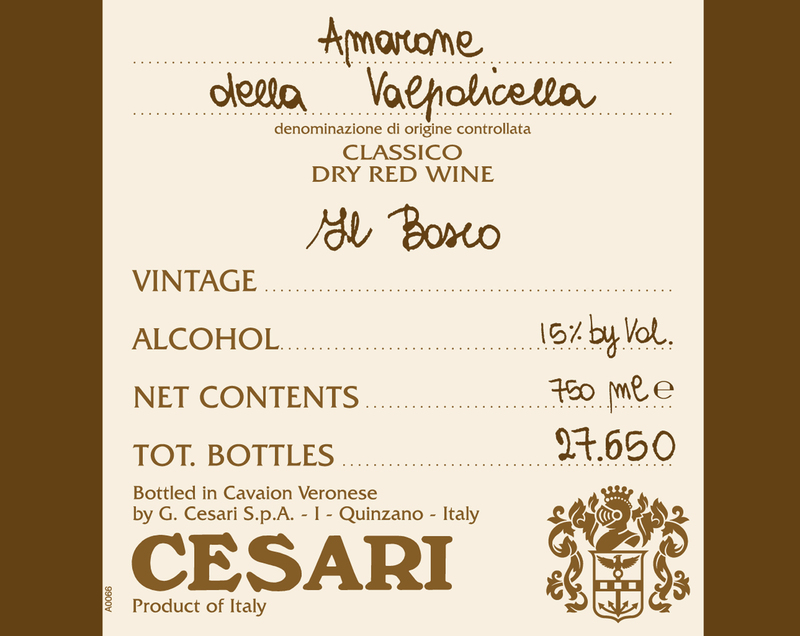 Amarone Il Bosco delivers a soft succession of sweet cherry, spice, plum cake and licorice-like aromas. The wine’s thickness density and natural concentration is packed tight with bright cherry and blackberry flavors. A more traditional style, well-integrated, this features an open-knit texture and subtle flavors of black cherry coulis, black raspberry and gumdrop, with a brambly note of vine clippings. Fresh, showing a modest, lightly tannic finish. Drink now through 2015. This is a lovely Amarone that offers seemingly limitless intensity and personality. The wine is richly redolent of red cherry, chocolate, spice, and tobacco. It tastes sweet and plush and delivers a very smooth and supple texture. Very nice. This shows fine balance between bright black cherry, currant and grilled plum fruit and accents of leather, tobacco, mesquite smoke and grilled nuts. There’s a chunkiness to the tannins, yet they find a fine fit in this rugged red. Aromatic florals and dried herb notes linger on the finish. Drink now through 2024. Here’s a sophisticated and elegant Amarone with very forward use of oak that supports its soft, velvety curves. The wine boasts think concentration, an inky color and loads of spice, candied fruit and tobacco. It’s full and soft with velvety tannins and a long finish.